If you ever find yourself planning a trip to Mars, there are a few logistical issues you have to sort out. Just small things: How do you put up with your companions over the two year trip? How do you prevent the deep space radiation from giving you cancer? And then there’s the question you may be asking if you’ve seen the new movie “The Martian,” or read the book by Andy Weir: Could you actually use your own poop to grow crops on Mars? If you’re part of a NASA mission to the Red Planet, you’d be provided with enough supplies to get you through the three months or so you’d be spending on the planet’s surface. In that scenario, you’d be able to enjoy the selection of dehydrated foods sent along with you. But if you end up stranded on Mars, you might have to resort to undignified measures like using your own poop for fertilizer until NASA can get back to you. That’s one of the major problems facing fictional astronaut Mark Watney, portrayed by Matt Damon in “The Martian.” Stranded with a limited supply of food, one of the most important problems Watney tackles is what he’s going to have for dinner — until the next mission arrives in four years. Luckily, he has twelve refrigerated potatoes, courtesy of NASA’s attempts to make the crew’s Thanksgiving dinner on Mars not completely terrible (as we all know, the mashed potatoes are the most important part of the meal). Watney needs to grow enough potatoes from his original twelve to make up a three-year shortfall in rations, possibly setting a record for the longest amount of time spent eating Thanksgiving leftovers. There’s just one problem. Mars is not that great for growing things. Its surface of oxidized iron dust is responsible for its striking red color and contains useful elements like sodium and potassium. But it lacks one key component: Bacteria. If you want to grow crops, you’re going to need bacteria. On Earth, bacteria play a crucial role in decomposing complex nutrients into simpler ones plants can use. Their most important function is to convert atmospheric nitrogen into nitrates, a chemical easily utilized by plants. Unless there’s a population of bacteria on Mars that’s been evading our rovers, there’s a good chance there’s nothing on the planet that can perform this role. You’re free to cart a ton of Martian dust into your habitat and stick your potatoes in it, but soon your potatoes will die for lack of nutrients. And then you’ll die for lack of potatoes. Watney’s solution is actually an ancient one: use the bacteria he brought with him. More specifically, use the bacteria in his poop. Although using human waste as fertilizer carries the risk of disease, it can work. The key is that the waste has to be composted first, allowing time for any dangerous pathogens to break down, a process that can take several months. So contrary to Watney’s actions in the book and the movie, in reality, he’d have to wait quite a while before he could even begin to grow his first harvest. In the meantime, how do you grow your crops before your poop has composted? There’s promising news in that regard from NASA’s Curiosity Rover, which discovered that Mars probably has some nitrates already. 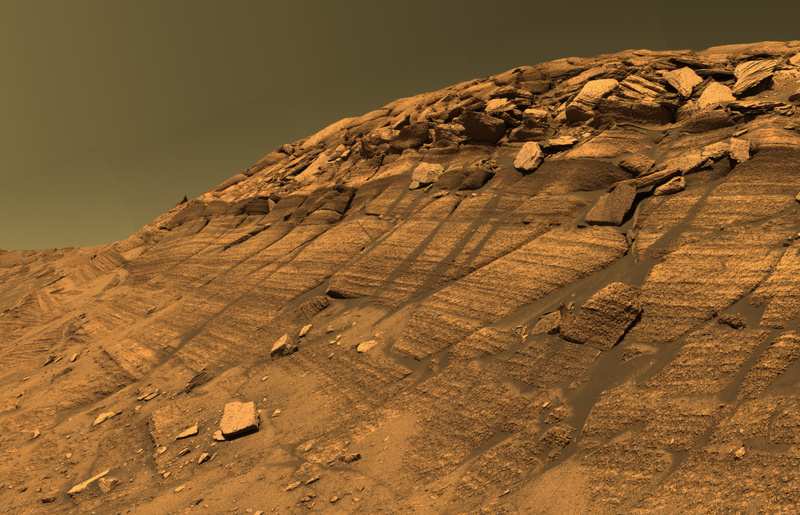 Curiosity discovered some areas with as much as 1,100 parts per million, much higher than the 30ppm considered sufficient for plants to grow, although most areas have much lower concentrations. But those nitrates have built up over the entire history of Mars and without bacteria, there’s no way to replenish them as your potatoes consume them. You’d have to keep hauling in new soil, which also contains perchlorates — chemicals used in rocket fuel, fireworks and bleach and definitely not used in gardens. It could serve as a short-term solution, but eventually you’ll need your homemade fertilizer. While Watney’s solution may involve a bit of indignity — and a long, hungry wait — it’s certainly better than the toxic alternative.